Armed robbers on Saturday morning invaded some churches in Akure , the Ondo State capital and robbed members of the churches of their valuables and the churches’ offering worth millions of naira. The churches affected , according to a source, were located at Ondo Road and Fanibi areas of Akure. The robbers reportedly spent several hours carrying out the operations without any interruption. They were also alleged to have shared their stolen items in one of the churches robbed. It was gathered that as the robbery was ongoing, some members of the church managed to call the control room of the Ondo State Police Command but there was no response from the command. 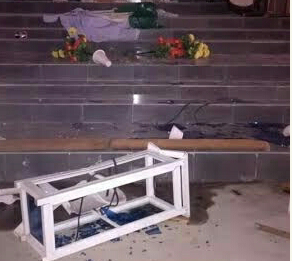 According to a source, the incident happened during the end of the month’ s prayer and vigil services of the churches. The hoodlums were said to have carried out the act between 2am and 4am on Saturday. One of the victims of the robbery, on condition of anonymity told our correspondent that four members of the robbery gang attacked them in their church and stole all they had , including the church offering. She disclosed that the hoodlums had robbed about five churches before they showed up in her church. She said the four robbers that entered her church were armed with guns, machetes, iron rod and wood, adding that they beat ‘uncooperative’ victims ruthlessly. She said, “ After finishing our vigil at about 3am on Saturday, all of us were going home when some armed men met us on the road. They told us they were members of the vigilance group in the area and they asked us to go back to the church. “They followed us to the church, on entering the church with us, they closed and lock the door from inside. One of them brought out a pistol and asked all of us to lie down and face the ground. They collected everything on us, especially our phones and money. The victim added that the robbers fled through the window when they heard that policemen were around the area. She said they removed the sim cards from their phones and dropped them on the chair of the church before fleeing. It was gathered that 15 minutes after the departure of the bandits, men of the Special Anti- Robbery Squad arrived the area. No arrest had been made by the police as of the time of this report. The men of the SARS were said to have recovered a gun and a mobile telephone dropped by the robbers at the scene of the incident. When contacted , the Public Relations Officer of the State Police Command, Mr. Femi Joseph, confirmed the incident and said the command had commenced investigation into it. “ We have take action on the incident, we have deployed our surveillance in that area and very soon we shall arrest the hoodlums. ” Joseph said.